I’m blessed to work with a wide variety of clients, but there’s a special place in my heart for helping artists get their work in front of a wider audience. So I was thrilled with Traci DeForge introduced me to Kathleen R. Bates to design her soon to be award-winning book titled Christmas Birds. What started as art created for Kathleen’s personal Christmas card over 40 years ago became a coffee table book featuring original paintings of birds paired with short meditations on the spiritual meaning of Christmas. The combination of art, nature, and Christmas themes gives this book broad appeal as a gift. Awards for Christmas Birds include 2015 USA Best Book Awards Finalist, 2015 National Indie Excellence Awards Finalist, and 2015 International Book Awards Finalist. In addition, Bates was nominated for the 2015 Georgia Author of the Year Award in the Specialty Book category. Available for purchase at www.ImagesFromHome.com, you might want one of these beautiful books for your very own and another to give to an artist friend or birdwatching enthusiast. Check out this preview of Christmas Birds. In addition to designing Kathleen’s book, I designed her Rising Fawn publishing logo, the Images from Home logo, as well as a postcard, bookmark, and brochure that she uses to promote her book to individuals and retailers. I also wrote a press release when she was a featured author at the 2016 International Christian Retail Show. Contact me to discuss how I can help bring your book from concept to creation. Or, let’s talk about your marketing and graphic needs. Call me at 678-521-8820 or visit VanessaLowry.com to see more examples of my graphic design, writing, marketing, and art projects. I met author Jennifer Brommet nearly ten years ago through a loosely organized group of fellow graphic designers. She is also the founder and director of the nonprofit True Identity Ministries. Short on time and understanding two design heads are sometimes better than one, Jennifer contacted me to help with the formatting and publishing of her book. An added bonus for me was learning about Jennifer’s childhood and how her faith has impacted her choices in life. In the book, Jennifer shares her own difficult journey from severe rejection and depression to freedom and joy in embracing her TRUE identity in Christ and how she felt called to start True Identity Ministries. Continuing the swan theme, I created this graphic of wings that was used to identify a key segment in each chapter. I was thrilled when Jennifer’s book was nominated for the Georgia Author of the Year Award (GAYA). The GAYA ceremony has the distinction of being the oldest literary awards ceremony in the Southeastern United States. Go here to find out more about Jennifer and True Identity Ministries. Paperback and Kindle versions of True Identity are available on Amazon. Contact me to discuss how I can help bring your book from concept to creation. Or, let’s talk about your marketing and graphic needs. Call me at 678-521-8820. Find out more about me by visiting my LinkedIn profile. I love working with clients who inspire me—especially when that client is already a friend. Compelled to Inspire was a joyful collaboration with Jill Felts, founder and CEO of Compelling Creations. I helped Jill develop her manuscript from interviews, blog posts, and stories—lots of stories. Jill recorded and wrote stories of her journey as an entrepreneur—challenges she has encountered and the people who have encouraged her. I put my radio host skills to work while interviewing Compelling Creations Consultants from around the United States, then pulled out quotes from the transcripts to intersperse in the chapters. We created an outline . . . then changed it . . . then expanded it. Jill and I wrote and sent manuscript drafts back and forth many times. As we neared completion, we fine-tuned the manuscript with the help of editor Nanette Littlestone. Jill’s jewelry designs have been central in the evolution of Compelling Creations. The impact of any art has two dialogues: the impact creating the art has on the artist and the impact the art has on the audience who views it, or in this case, wears it. In Compelled to Inspire, we highlighted popular pieces of Compelling Creations jewelry—telling the story of Jill’s creative process in designing a particular piece, how customers respond to it, and how customers and Consultants are able to share their faith and stories of their lives as they wear the jewelry. Compelling Creations trademarked tagline is “Wear It and Share It” and that’s exactly what happens. Compelled to Inspire is filled with Jill’s reflections on universal issues that often hold us back from reaching our greatest potential. Her experiences, and those of her Consultants, guide readers to expand their view of possibilities and embrace strategies for success. This book is designed not only to share Compelling Creations’ history and purpose, but it also uses personal stories to encourage readers to release and renew their minds and spirits daily, to strive for their goals and overcome whatever is holding them back, and to journal their thoughts along the way. “As everyone can see from the wide variety of books Vanessa has brought to fruition, she doesn’t have a set ‘formula’ for layout and design. She REALLY feels what the writer is trying to convey through words and matches that feeling with the visual design for the individual’s book. “Vanessa is easy to work with, on task and on time. After interviewing all our participating independent sales consultants, she filtered through the long transcripts to find just the right nuggets to include in just the right spots. My friend Essie Escobedo owns a company called Office Angels. Her “angels” help small businesses with administrative support, marketing assistance, bookkeeping, event planning, follow-up, and more. With Office Angels taking care of these essential tasks, the owner and key staff members are able to concentrate on selling and delivering on what they do best. When Essie and I met to discuss ideas for her book, I recalled an e-newsletter she had sent with the title “Stop Doing That!” Brilliant! The title had captured my attention and prompted me to read the full article. After deciding this was the perfect book title, the manuscript came together easily. Essie gathered content she had written previously for newsletters, brochures, her website, and other marketing materials. Then, with the help of writing coach Dr. Tim Morrison, they developed the manuscript for Stop Doing That! 21 Activities Critical to Business Success That YOU Shouldn’t Do. I designed the cover and formatted the interior. The result is a pocket-sized 5.5″ x 5.5″ book that is easily read by even the busiest entrepreneur. I’ve known Essie for many years, but I learned a few things I didn’t know through her author bio in the book—that she has a degree in physics and a black belt in karate. I already knew she was kick-a** smart. . . I just didn’t know how she got there! Dr. Tim and I had the pleasure of interviewing Essie for Write Here, Write Now radio. Essie tell how Stop Doing That! serves as an expanded business card to highlight activities critical to business success that Office Angels provides for clients. Listen to the archived show here. Find out more about Essie, about Office Angels, and purchase her book at www.officeangels.us. Wendy Ellin is passionate about helping people “Get More Life out of Life!” Her book Enough is Enough, Get Control of Your Stuff provides a simple system for getting control of your time and your daily work in order to succeed with efficiency, energy, productivity, balance, and joy. As Wendy began expanding her career to include professional speaking, she realized she needed a book to position her as an expert in this field of productivity and organization. She wrote the book based on content from her Productivity Workshop. The manuscript came together quickly . . . at the same time Wendy was recovering from an arm injury and helping plan her daughter’s wedding. I interviewed Wendy on Write Here, Write Now, just a few days after the wedding. Here is what she said about being able to accomplish more in less time when you’re focused and organized! Find out more about Wendy’s book and download a free chapter. I’m sending kudos right back to Wendy. I had so much fun working with her. It’s a pleasure to work with an author as in “control of her stuff” as Wendy! My clients inspire me. Especially those who go with their guts, grow in the process, and share it with others. In 2007, Michele and Wayne Sharp traveled from Bayfield, Wisconsin on Lake Superior to Punta Gorda, Florida aboard their Island Packet 445 sailboat. They chose the long route, which took them through the St. Lawrence Seaway and the Canadian Maritime provinces. Wayne had long dreamt of such a trip, but Michele, who didn’t even feel qualified to call herself a sailor, was content to cruise Bayfield’s Apostle Islands National Lakeshore. Even her longest voyage of 100 nautical miles caused her great anxiety, so making the 5,000 mile trip was out of the question . . . initially. Michele recounts how she got from “NO” to “GO” in a few short weeks, and speaks honestly and from her heart as she works through her fears and inexperience to become a real sailor. “Today Vanessa completed her work on my book, a week before deadline, and I couldn’t be more pleased with her. Vanessa’s design work is masterful and gives me a level of professionalism that exceeds my expectations and merit. “Formatting of my book was more complicated than most, due in part to the inclusion of over 170 color and black and white photos, but Vanessa was undaunted. I am a perfectionist with an eye for detail and had countless edits, but Vanessa was unflappable. She was always professional, always positive, and always a pleasure to work with. “I am in Minnesota and Vanessa is in Atlanta, but distance was no impediment. We conducted our business through email and a couple of phone conversations, and not once did distance become an issue. Listen to Michele’s interview on Write Here, Write Now as she talks about her journey of guts, growth, and grace — both on the Lena Bea and through publishing Adventures of a Once Reluctant Sailor. Find out more about Michele and purchase a copy of her book at www.reluctantsailor.net. Let me know if I can help you bring your book from concept to creation! Or, let’s talk about your marketing and graphic needs. Contact me at 678-521-8820. Find out more about me by visiting my LinkedIn profile. I have really fun clients. And one of the most fun is Myra McElhaney. 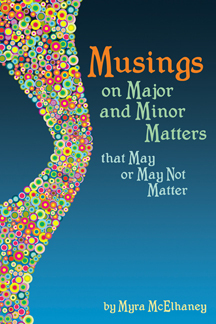 The recent project we completed together is her book, Musings on Major and Minor Matters that May or May Not Matter by Myra McElhaney. The title makes me laugh out loud and her poetry caused me to run the gamut of emotions from laughter to tears. Sometimes a poem seems to be the best way to capture the snapshot of a feeling. Whether it’s an observation of life, happiness, grief or simple silliness, author Myra McElhaney writes poetry to express her feelings. Many of the poems in this book were a result of a ‘poem du jour’ challenge with her mentor and friend Russell G. Hood. She found that writing poetry was a fun, creative outlet and later discovered that when her heart was breaking after the death of her husband Phil McElhaney, she could put the pain on the page. Myra’s hope is that you have a laugh, relate to a feeling or find an insight from these Musings By Myra. Myra was my guest on Write Here, Write Now radio to talk about her book and how her network of contacts has helped her in gathering information and publishing her books. Myra also describes how how this book came into being. Myra calls me her “Graphic Design Goddess Extraordinare.” Just one of many reasons I love working with her! Myra’s books are available on Amazon. 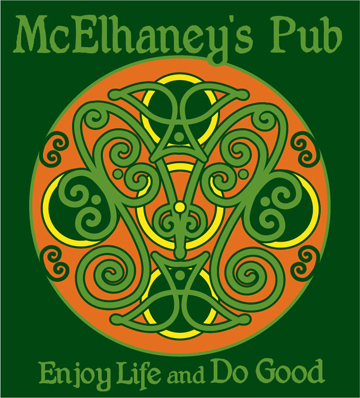 Contact her to order McElhaney Pub t-shirts. Let me know if I can help you bring your book from concept to creation! Or, let’s talk about your marketing and graphic needs. Contact me at 678-521-8820. Find out more about me by visiting my LinkedIn profile or watching my video profile. Friends sometimes become clients and my clients often become friends. And best of all is when a client becomes a friend and then becomes a client again! I worked with Anna Schachner more than 10 years ago to create a logo and business card for her side business as a designer of beautiful bead jewelry. As long as I’ve known her, she has been a talented writer and a professor teaching creative writing at Georgia Perimeter College. I was excited when Anna contacted me about helping design and format the first issue of The Chattahoochee Review published under her editorship. It has been great fun to reconnect and have a chance to work with her and her team, including Lydia Ship, the Review managing editor. In addition to this issue of the Review, I helped them update their logo and designed bookmarks, signage & ads. This is what Anna said about working with me, “When we hired Vanessa Lowry to do the layout and graphic design of The Chattahoochee Review, a literary journal whose editorship was given to me just a few months before, I already knew that Vanessa was a great designer. What I would learn, however, was that in addition to her design skills — the logo she did for us is so perfect — she brings a kind of intuition that we desperately needed. In other words, being new editors and new to the publishing business, we didn’t know what we needed, but she did! She was patient, insightful, and always very quick to remind us of how changing one element of a design changes the entire thing. She even caught some typos that we didn’t. Her ability to be accommodating under our very tight deadline also meant the world to us. I can’t say enough good things about her. This issue of The Chattahoochee Review launched over Labor Day weekend at the Decatur Book Festival. Anna was interviewed at the Write Here, Write Now radio remote on Saturday of the festival. Listen to interview number 5 to hear more about the writers featured in this double issue. 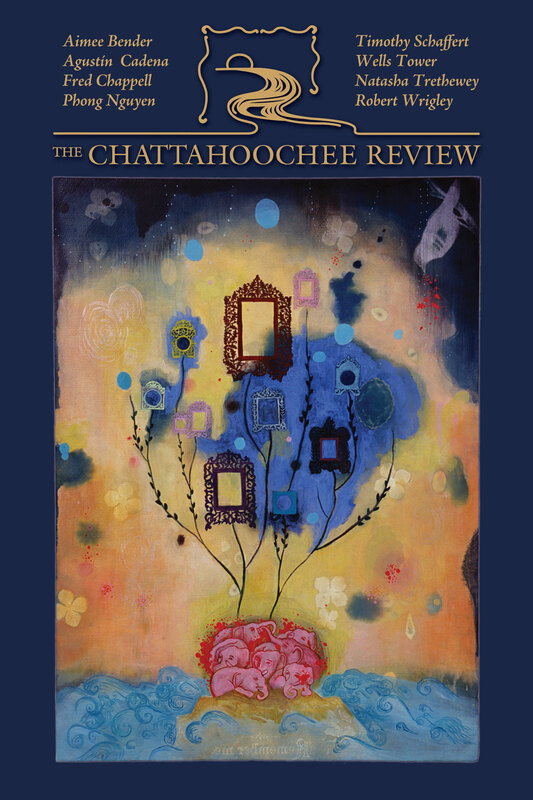 Subscribe to The Chattahoochee Review for only $19 for one year or $36 for two years. They accept submissions of poetry, fiction and nonfiction. Check out their website for full details. I love collaborating and it’s fun to work with others who also embrace that idea. Cathy Horvath gathered stories and recipes from over 100 contributors to create her book. Recipes for Life: Food for the Body and Nourishment for the Soul features stories about overcoming depression, grief and financial ruin, navigating change and returning to joy. Special recipes from many contributors are scattered through the book, along with stories of why these foods and memories are important. After reading Cathy’s book, you are likely to feel more hopeful, more thankful, more passionate, better about life and possibly a little hungry. I interviewed Cathy on the Write Here, Write Now radio show that I guest host once a month. Our show topic was about writing and publishing after retiring. Hear what Cathy has to say about this NEW career she has embarked upon. 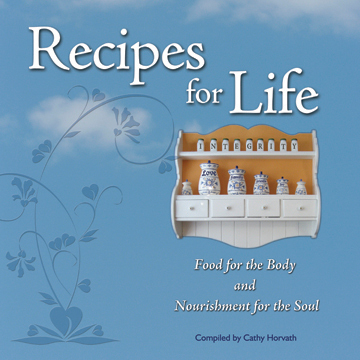 Recipes for Life is available on Amazon or you can purchase multi-packs of books at a reduced price on Cathy’s website. This book makes a perfect gift… I even gave one to my mom. In addition to her book cover and the interior book design, I also designed Cathy’s business cards, bookmarks, a speaker one-sheet and her website.